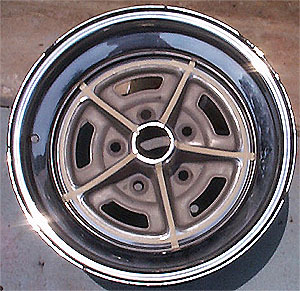 These are the materials to refinish the chrome Buick Rallye wheels. The RM 900 Pre-Kleano removes any grease, oil and silicone residue from the chrome and areas to be painted. The Fresh Look paint, available from Kmart, gloss black, works great to paint the black inserts. 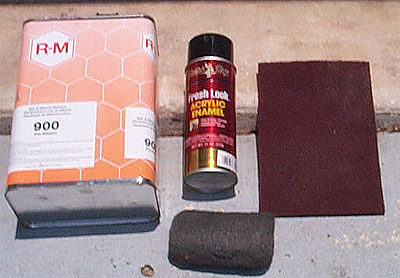 Original factory paint was semi-gloss and usually ends up looking flat a short time later. 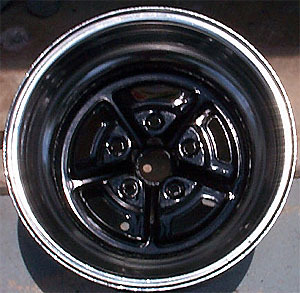 With gloss black, as time goes by, the wheels look semi-gloss and are easier to keep clean. The scotch brite pad works great to get into those tight corners. The "0000" steel wool removes all the grime and dirt from the chrome surfaces without damaging the surface. 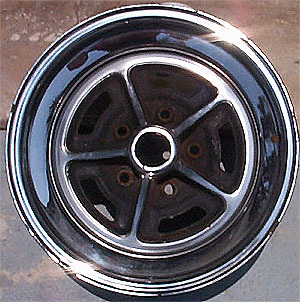 Here is the 15" rallye wheel that needs refinishing. This wheel has the original paint and has not been taken care of by the previous owners. 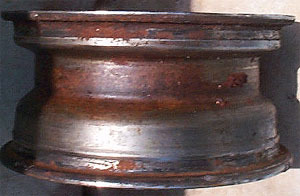 This is typical rust on the inner surface. These areas need to be steel brushed or sandblasted to remove all rust. The back side of the rim was never painted at the factory. This area is very difficult to clean with wire brushes. Best bet is to sandblast the rusted areas while staying away from the chrome inner surface. This particular wheel has no grease on the backside. Use Mean Green or Castrol Super Clean to remove all grease/oil residue before sandblasting. Wow, what a difference a little elbow grease and 0000 steel wool does to the chrome surface. This stamping is found on the inner rim surface and after a little cleaning shows up clearly. 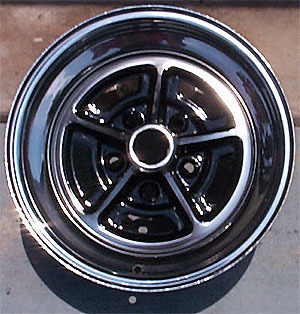 This is a 15" Buick rallye wheel. Wheels will be stamped made in USA or Canada. 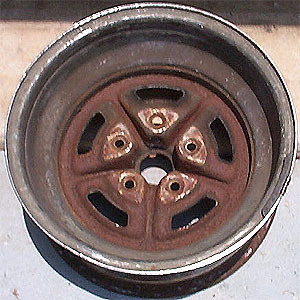 Same wheel again after sandblasting which provides the best surface cleaning. Wipe down with 900 Pre-Kleano to remove any oily residue from the chrome surface. Always use compressed air to clean out sand from the rim crevice between the inner hub and outer chrome rim. 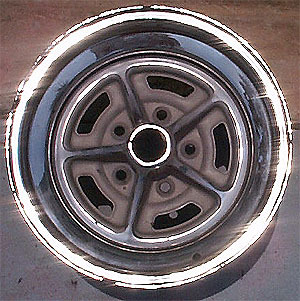 Wow, need sunglasses to look at this wheel! I like to use 1/4" masking tape available from body shop supply stores to outline the area to be painted as well as the 5 ribs. The 1/4" works great since it allows you to make the turn/bend without breaking/tearing. I then follow up with 3/4" for the next perimeter taping. The final tape is 2" which covers most of the chrome. This is the back side finished with new paint and the chrome area polished with 0000 steel wool. 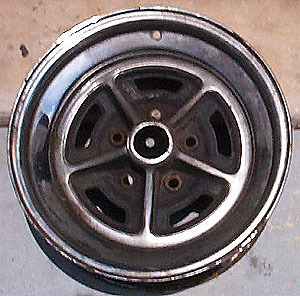 Here is the finished 15" rallye wheel, ready for tires and a Buick to put them on. It takes approximately 1 hour to do each wheel from start to finish. Any overspray can be removed with a rag dampened with 900 Pre-Kleano.